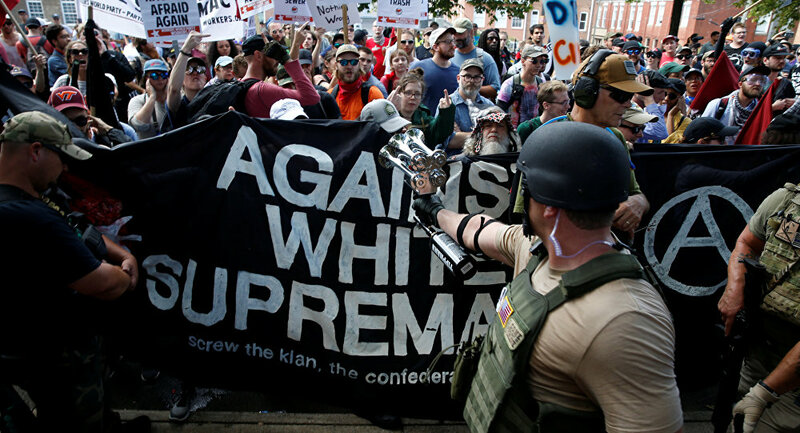 WASHINGTON (Sputnik) — A court in the US state of Virginia should block future Unite the Right rallies in the city of Charlottesville, according to a lawsuit filed on Thursday by the Georgetown Law’s Institute for Constitutional Advocacy and Protection (ICAP). The group maintains that the organizers violated a state law prohibiting paramilitary activity in their August 12 demonstration, which turned violent when the alt-right group clashed with black-clad, bandanna-wearing members of the group antifa over the fate of monuments dedicated to the long-dead heroes of the Confederate States of America. "Virginia law clearly reflects the American tradition that private armies are anathema to a well-organized society," ICAP Senior Litigator Mary McCord stated in a press release explaining the action. "Our complaint shows that there are legal tools available to ensure that the streets do not become battlefields." According to the complaint, the rally’s organizers solicited private militias to attend the rally, held group-wide planning calls and circulated an instructional document entitled "General Orders," the release explained. On Wednesday, 11 local residents injured during the violent protests filed a separate lawsuit seeking monetary damages. Clashes between rally participants and counter-protesters, including Antifa, occurred when police withdrew and allowed the two groups to meet, according to published reports. One counter-protester was killed in a vehicle attack by a motorist who had driven to the city from Ohio to attend the rally. A nationwide furor resulted when President Donald Trump tweeted that both sides shared blame for the melee. Rally organizers have vowed to return to Charlottesville to continue protesting, ostensibly against efforts to remove the monuments of Confederate leaders.